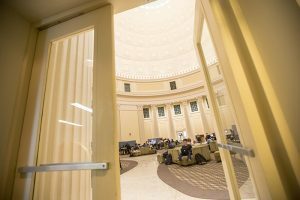 As part of the Libraries’ ongoing effort to improve our spaces, acoustical panels will be installed throughout the Barker Reading Room to improve sound quality under the Great Dome. The installation begins on Monday, July 2, and continues for roughly two weeks until all of the panels have been installed. The work is scheduled to take place Monday-Saturday, from 5am to 1pm each day. Barker and its study spaces will remain open throughout the duration of the installation, but some areas will be reserved to accommodate the work. Users in the space can expect noise. We apologize for any inconvenience or disruption caused by this work.